In the previous tutorial we introduced the concept of "custom controls" with a simple example. In this tutorial we go one step further and implement Flurry Analytics as custom control. 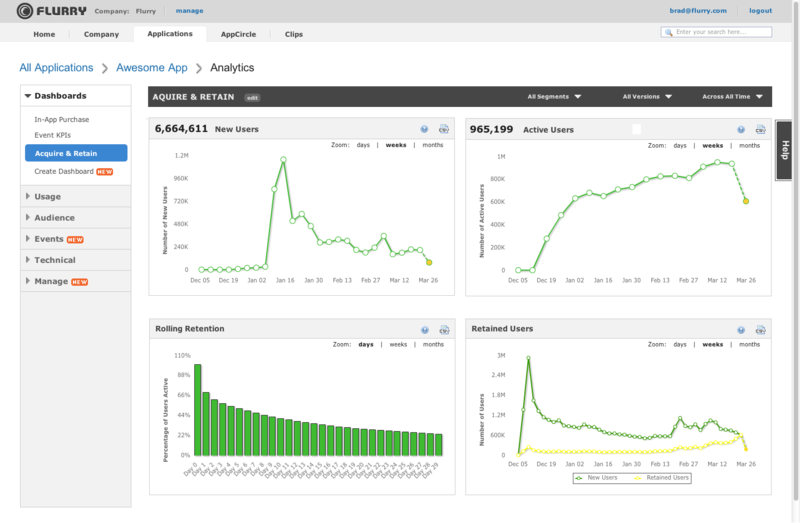 Flurry Analytics is a free analytics service to measure, track and analyze the app performance. The tutorial uses the "Flurry Android SDK vAndroid SDK 5.3.0" and the "Flurry iPhone SDK viPhone SDK 6.3.0", the latest versions which were available at the time of writing. In this tutorial we only use the analytics feature and omit the usage of Flurry Ads. To be able to use Flurry as analytics service, we first have to setup the app on the Flurry server. We need to register on dev.flurry.com and create a separate project for Android and iOS. The unique ProjectApiKeys can then be used in the appropriate configuration files. We start by defining the interface of our Flurry control, thus the C++ methods we will use to access the Flurry SDK. We store all Flurry relevant files in the subfolder flurry, to keep the project hierarchy clear. @brief Log a optionally timed event without parameters with the Flurry service. To end the timer, call endTimedEvent(String) with this eventId. @brief Log a optionally timed event with one parameter with the Flurry service. @brief Log a optionally timed event with parameters with the Flurry service. The event is identified by the eventId, which is a String. A Map<String, String> of parameters can be passed in where the key is the parameter name, and the value is the value. Only up to 10 parameters can be passed in with the Map. If more than 10 parameters are passed, all parameters will be dropped and the event will be logged as if it had no parameters. A Map<String, String> of the parameters which should be submitted with this event. @brief End a timed event. End a timed event with one parameter. Only up to 10 unique parameters total can be passed for an event, including those passed when the event was initiated. If more than 10 unique parameters total are passed, all parameter updates passed on this endTimedEvent call will be ignored. End a timed event with parameters. Use OnError to report errors that your application catches. Flurry will report the first 10 errors to occur in each session. The name/id of the error. Use onPageView to report page view count. To increment the total count, you should call this method whenever a new page is shown to the user. As in the previous tutorial we declare a static Create method and some pure virtual methods to log events, errors and page views. The function parameter timed is a default parameter with the default value false. Hence the specification of this parameter is optional. Next we implement a default version (FlurryControlDefault) of our control, which merely prints simple debug messages. By using the default implementation, we are now able to instance a FlurryControl object and use it in our app. The default implementation produces the following output. Next we integrate the "Flurry Analytics Android SDK" for the Android version or our app. At first we have to add the JAR archive FlurryAnalytics_5.3.0.jar to our project. We store the JAR archive in a separate directory android/jar. You can only assign one directory for all JAR files in the Makefile. It is a good practice to create a separate directory and store all JAR files there. The same applies for Java files, Proguard fragments, manifest fragments etc. We add the file by specifying the parameters MURL_ANDROID_JAR_PATH and MURL_ANDROID_JAR_FILES in the common Makefile module_flurry.mk. Additionally we set the required permissions for the Flurry SDK. The Flurry SDK requires the addition of appropriate FlurryAgent calls in the app methods onCreate(), onStart() and onStop(). The Interface MurlCustomControl can be used to get callbacks to these app methods. Therefore we create a Java class FlurryControl and implement the interface MurlCustomControl. Additionally we create the class FlurryConfiguration to configure the Flurry SDK. 300 Events for each app. Each event can have up to 10 parameters, and each parameter can have any number of values. // Use setLogEnabled to enable/disable internal Flurry SDK logging. This should be called before init. // Sets the log level of the internal Flurry SDK logging. Valid inputs are Log.VERBOSE, Log.WARN etc. Default log level is Log.WARN. This should be called before init. //Use setLogEvents to enable/disable the event logging. This should be called before init. //Use this to log the user's assigned ID or username in your system. This should be called before init, if possible. //Use this to log the user's age. Valid inputs are between 1 and 109. This should be called before init, if possible. //Use this to log the user's gender. Valid inputs are Constants.MALE or Constants.FEMALE. This should be called before init, if possible. //Sets the version name of the app. Flurry automatically uses the versionName attribute from manifest if not set! This name will appear in the https://dev.flurry.com as a filtering option by version. This should be called before init. // Get the version of the Flurry SDK. 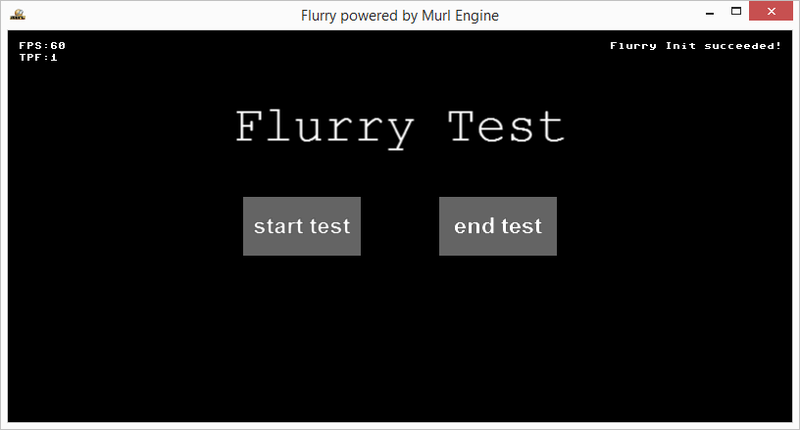 // Get the release version of the Flurry SDK. We again list the new files in the Makefile and register the new class as MurlCustomControl class. Next, we define our JNI bridge class containing the static Java methods which we will call from C++. Log a possibly timed event with the Flurry service. The method logEventPrepare can be used to add parameters to the event. Only up to 10 unique parameters total can be passed for an event. Log a possibly timed event with one parameter with the Flurry service. Prepare parameters for a logEvent or endTimedEvent execution. The data is collected in a Map. The method logEventPrepare can be used to add up to 10 parameters to the event. We list the new file in the Makefile and register the class as JNI class. Now we are able to create the Android C++ implementation of our FlurryControl and call the appropriate JNI bridge methods. We list the new file in the Makefile as SRC file and depending on the platform, we either use the Android version or the default version. The events also correctly appear in the Flurry Analytics Dashboard. Please note that it can take up to 24 hours for the events to show up. To be able to create a release build, we additionally have to configure Proguard via a text file. The text file is also added to the Makefile. The use of the "Google Play Service Library" and the Android "v4/v7 Support Library" is not necessary for analytics. Anyway, if desired both libraries may also be added to the project. The following steps are necessary to add the Flurry Analytics SDK for iOS. At first we have to add the Flurry iOS SDK files to our iOS project. We copy the files into the directory ios. The easiest way to add the files to the project is by using the Dashboard and the command "Update Project". Additionally the library has to be added to the targets in Xcode. Now we can create the iOS implementation in C++ and Obj-C for our FlurryControl. //Retrieves the Flurry Agent Build Version. //Generates debug logs to console. //This is an optional method that displays debug information related to the Flurry SDK. display information to the console. //The default setting for this method is NO which sets the log level to FlurryLogLevelCriticalOnly. //This is an optional method that displays debug information related to the Flurry SDK to the console. //The default setting for this method is FlurryLogLevelCritycalOnly. //Enable automatic collection of crash reports. //This is an optional method that collects crash reports when enabled. The default value is NO. //Use this method to allow the capture of custom events. The default value is YES. //Explicitly specifies the App Version that Flurry will use to group Analytics data. //Assign a unique id for a user in your app. //Use this method to capture the gender of your user. //Only use this method if you collect this information explictly from your user (i.e. - there is no need to set a default value). //Allowable values are "m" or @c @"f"
//Use this method to capture the age of your user. //Set the location of the session. That finishes the iOS implementation and now also the iOS events are recorded with Flurry Analytics. Please note that it may take up to 24 hours until you can see the events in the Flurry dashboard.